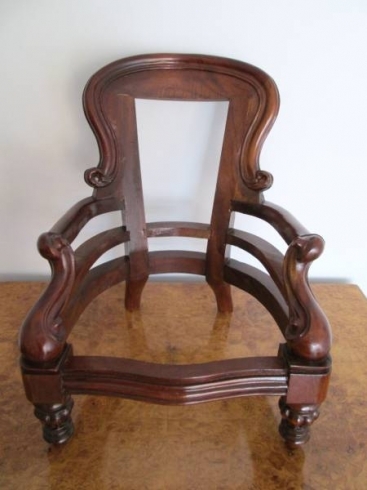 A beautiful little chair hand made from solid mahogany. The chair received new French polish approximatly 25 years ago and has a wonderful colour to the frame now. I will traditionally upholster this miniature chair for you, with new horse hair and fibre upholstery, plus the chair can be top covered with your own fabric choice. If you own an antique teddy bear or doll, this is the perfect chair. Dimensions – height 42 cms, width 33.5 cms, depth 41 cms.